Cara Carlton Perry was appointed in 2017 by Senate President Joe Negron. She is the Assistant Vice President of Communication for Florida Atlantic University’s Northern Campuses, which include Harbor Branch Oceanographic Institute in St. Lucie County and John D. MacArthur Campus at Jupiter. She has enjoyed 15 years of service at FAU in various external relations roles. 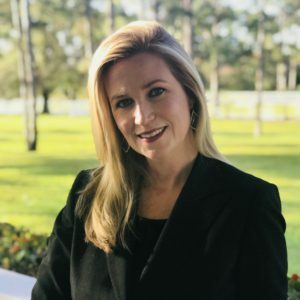 Cara has served on three Chamber of Commerce boards, the United Way of St. Lucie Board of Directors, and as president of the Florida Public Relations Association, Treasure Coast Chapter. She is a member of Leadership Florida and the Honda Classic’s CouTOURe Club, and she is an active volunteer with Junior Achievement. Cara received her bachelor’s degree in communication from Florida State University and her master’s degree in university administration from the University of Central Florida. She is a proud fifth-generation Florida native and resides in Martin County with her husband Paul and son Will.